Ideal for sealing seams, crevices, cracks and openings. Griffon is expanding its HBS-200® Liquid Rubber range with a new 310 gram cartridge packaging. In addition to the buckets (1 L, 5 L and 16 L) and HBS-200® Tape, Griffon now also launched a cartridge, making water and airtight sealing of seams, crevices, cracks and openings even easier. The specially thickened cartridge quality is ideal for both water and airtight sealing of floor-wall connections, frame connections, roof openings and expansion joints. HBS-200® Liquid Rubber is a universal, protective sealant to permanently seal and protect virtually all materials and surfaces, elastic and durable. The 100% water and airtight product is easy and fast to apply. In addition, it is independently tested and certified and has a minimum life expectancy of 20 years (tested in accordance with EN 1297). Griffon HBS-200® Liquid Rubber is the perfect sealant, protection and repair for indoor and outdoor use. It doesn’t allow any water, moisture and chemicals to get through. It is free of solvents and VOC, non-toxic and water-based. The very high permanent elasticity – up to 900% – always shrinks back to its original size. The product is also UV and saline resistant and withstands huge temperature fluctuations (-40 °C to + 160 °C). HBS-200® Liquid Rubber attaches well to many surfaces, such as concrete, brick, timber, PVC, zinc, bitumen, EPDM and metal. HBS-200® Liquid Rubber in a cartridge is CE-certified for waterproofing and protection of structures below ground level, foundations and basement exterior walls (according to EN 15814). The 100% water and airtight sealing of the universal coating was proven based on the European standards EN 1026, EN 1027, and EN 12114. The durability of HBS-200® Liquid Rubber in roofing applications was tested intensively based on EN 1297. Griffon HBS-200® Liquid Rubber cartridge, for a 100% water and airtight solution! Griffon offers the professional end user easy fast and reliable solutions for building, bonding & fixing, wood construction, sealing & protecting. 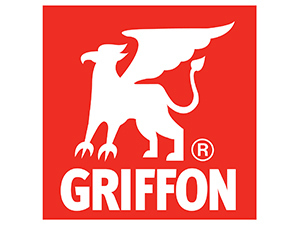 With this, Griffon guarantees a complete selection for the building and installation sector. With several sales offices in Europe, Griffon has built up a strong international market position. Griffon is part of Bolton Adhesives / Bolton Group.